I can guide and instruct rock climbing, winter mountaineering, ski-mountaineering and mountain navigation at venues throughout Scotland and northern England. 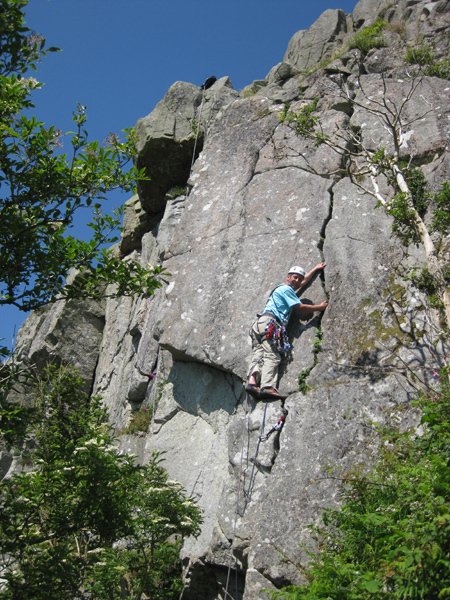 In the past I have run climbing sessions and mountaineering courses for individuals, military groups, schools, groups of friends, Mountain Rescue Teams and outdoor clubs. My wife Linda also works freelance as an outdoor instructor. Most of the work we do is "tailor made" to meet clients specific requirements. See below for some notes about my prices and experience and qualifications, and also a we bit more about Linda. Dave climbing Elders Crack at Clifton Crag in the spring a couple of years ago. An incredible day of good weather! Scottish Ski Mountaineering More details of courses and private guiding if you're interested in learning ski-mountaineering skills in Scotland. Winter Skills Courses Details, dates and prices for winter skills courses in Scotland. Andes Website - Visit the website of my main business "ANDES" if you're interested in climbing, skiing or trekking in South America. Please call or email for details and a quote for private guiding or a bespoke course. As a guideline my normal rates as an instructor are between £180 and £240 per day, depending on the activity, equipment required, location, number of clients and timing. Shorter sessions locally of 2 to 4 hours would normally cost from £80-100. Generally speaking this cost can be shared between two or more people and will also be cheaper for multiple days or sessions. Please phone or email me to discuss your requirements. 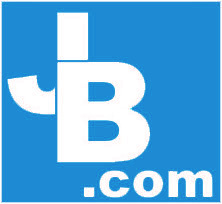 Contact details appear below and on the index page of this website. To arrange private guiding or instruction please call or email me to discuss your requirements. I am a professional Mountaineering Instructor and member of the AMI. I hold the highest level of mountaineering qualification for the UK, the Mountaineering Instructor Certificate, (MIC) and have also done the BASI Alpine Level 1 ski instructor course. For more information on my experiences please see my personal profile page. 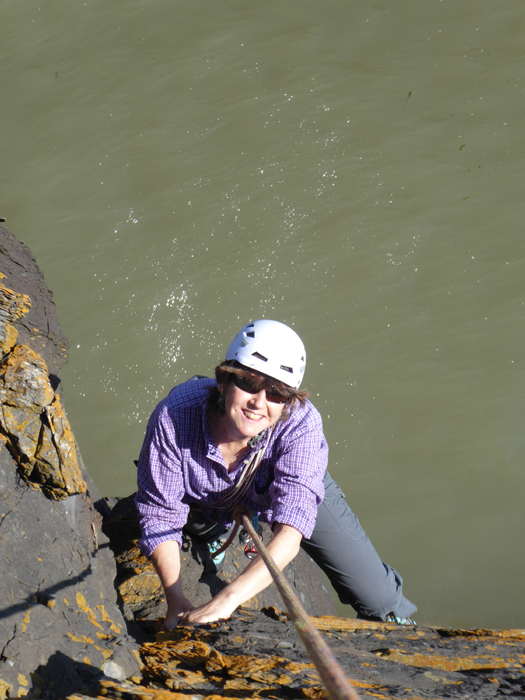 My wife Linda Biggar is also qualified to teach rock climbing and summer and winter hill-walking. She has the Mountaineering Instructor Award (MIA) qualification and Winter ML. In the past she has also been an active orienteering coach and Alpine Ski Leader, and she worked for fifteen years at the outdoor education centre in Castle Douglas. or write or call in at:- 37a, St. Andrew Street, Castle Douglas, Kirkcudbrightshire, DG7 1EN, Scotland. 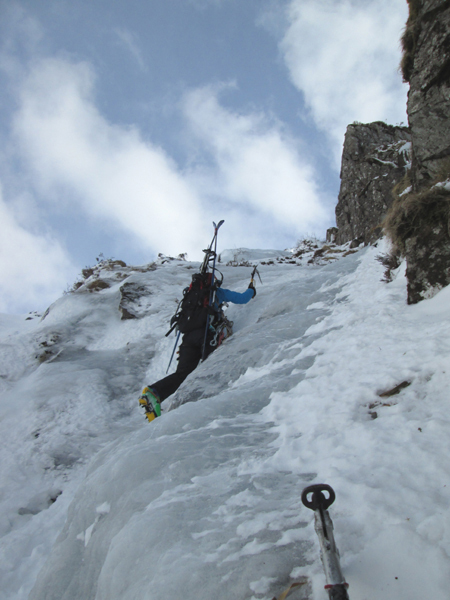 Linda Biggar on the main garde III pitch of Chippys Downfall, Black Gairy, Merrick, March 2014.